Ticket includes entry to the festival and your first drink free! The 1st annual Baltimore Wing Festival is coming! 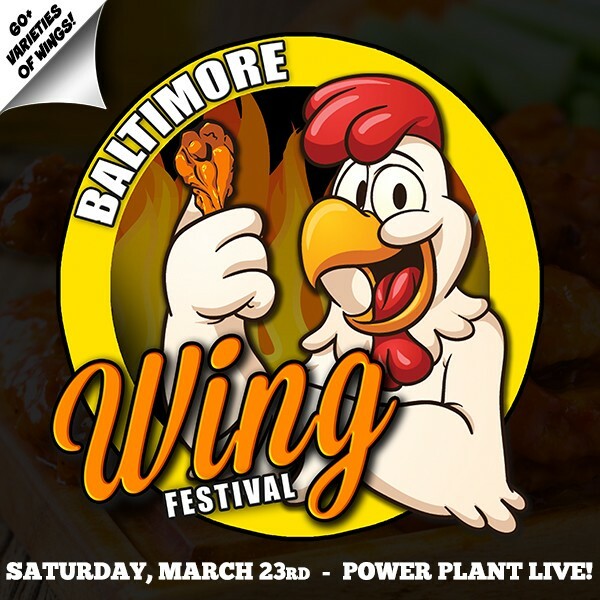 Join us on Saturday & Sunday March 23rd & MArch 24th at the action-packed Power Plant LIVE!, just one block from Baltimore's famous inner-harbour, for a fun filled family day filled with wing themed activities & madness! The 2-Day Baltimore Wing Festival will feature a variety of mouthwatering delectables from over 20 of the area’s best restaurants & food trucks with over 60+ styles of wings to choose from! Wing masters from throughout the city & surrounding areas will on hand to cook up everything from BBQ to out of this world HOT! - Merchandise Vendors, Games & more! Whether it’s smoked, fried, grilled, sauced, spiced, or imaginative, this festival will attract wing lovers and fanatics of all ages (KIDS 8 & UNDER ARE FREE), Restaurants & food purveyors will be dishing out a variety of $1 Jumbo Wings (each sold separately). Wings will work on a voucher system – there will be various voucher stations throughout the festival & all vouchers will be exchanged at each vendor for wings and food related items. There will various bars, beverage stations & beer gardens serving ice cold brews, fine spirits, water, soda & other refreshments. Additional vendors will be on hand to sell funnel cakes, cotton candy, ice-cream, water ice, hot chocolate, desserts & other goodies! - Mega Hot Wing Eating Contest: Battle it out with your fellow competitors to see who can eat the most Mega Hot Wings! Signup forms coming soon & will be limited to the first 12 participants. - Ranch Dressing Chugging Contest: Finish your bottle of Ranch dressing the fastest to be crowned The Ranch King! This one is not for the faint of heart, or stomach! - Costume Contest: Costumes, makeup, chicken hats etc. are Highly Encouraged! Dress to impress for your chance to be crowned best dress king & queen of the Baltimore Wing Festival! The area's best will be battling it out to see who has the best wings in all the land! *All tickets purchased for The Baltimore Wing Festival by phone or online are final. We Do Not issue refunds or exchanges & this is a Rain or Shine indoor/outdoor event. Ticket prices are subject to change and increase. View More Events Organized by Baltimore Wing Festival. Welcome to Wing Heaven at the Baltimore Wing Fest! This event is organized by Baltimore Wing Festival.